This is a website for anyone interested in Sir John Cowperthwaite, post-war Hong Kong and economic growth more generally. For most people John Cowperthwaite is a now largely forgotten Scotsman. And yet he was central to designing and implementing the economic policies that enabled Hong Kong’s remarkable post-war economic growth. When he arrived in Hong Kong in 1945 it had a per capita income of only 30% of its mother country, Britain. 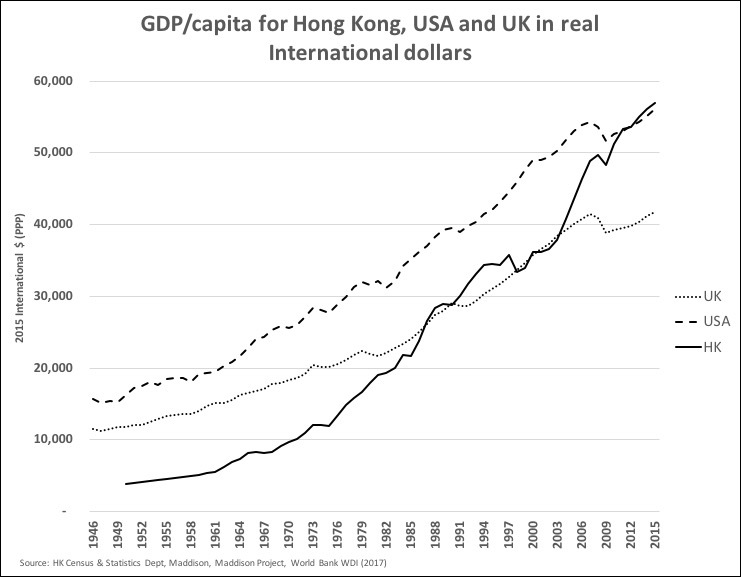 By the time Hong Kong was reunited with China in 1997 it had matched Britain’s gdp/capita. And now it is 40% higher. How did that happen? Who was John Cowperthwaite? And are there lessons that we can learn today from this extraordinary success story? At the end of the Second World War, Hong Kong lived up to its description as “the barren island.” It had few natural resources, its trade and infrastructure lay in tatters, its small manufacturing base had been destroyed and its income per capita was less than a quarter of its mother country, Britain. As a British colony, it fell to a small number of civil servants to confront these difficult challenges, largely alone. 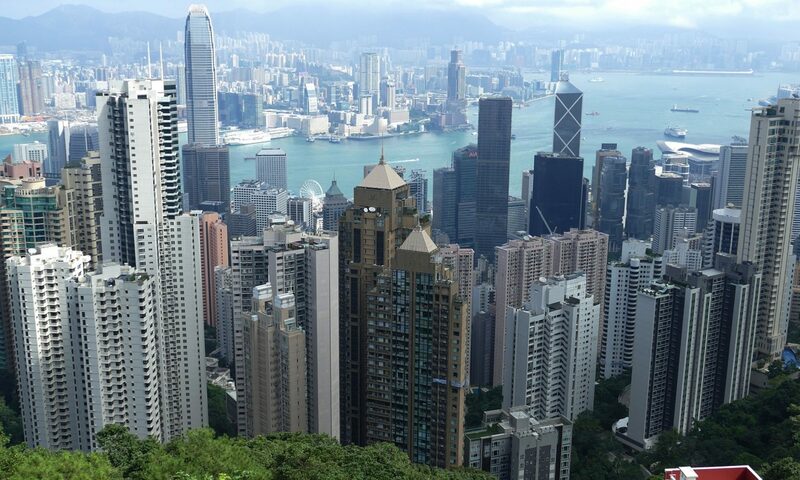 But by the time of the handover of Hong Kong to China in 1997, it was one of the most prosperous nations on Earth. By 2015 its GDP per capita was over 40% higher than Britain’s. How did that happen? Around the world, post-war governments were turning to industrial planning, Keynesian deficits and high inflation to stimulate their economies. How much did the civil servants in Hong Kong adopt from this emerging global consensus? Virtually nothing. They rejected the idea that governments should play an active role in industrial planning – instead believing in the ability of entrepreneurs to find the best opportunities. They rejected the idea of spending more than the government raised in taxes – instead aiming to keep a year’s spending as a reserve. They rejected the idea of high taxes – instead keeping taxes low, believing that private investment would earn high returns, and expand the long-term tax base. This strategy was created and implemented by no more than a handful of men over a fifty-year period. 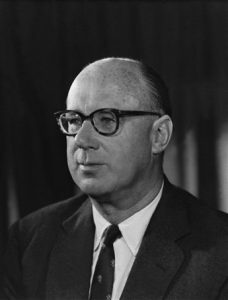 Perhaps the most important of them all was John Cowperthwaite, who ran the trade and industry department after the war and then spent twenty years as deputy and then actual Financial Secretary before his retirement in 1971. He, more than anyone, shaped the economic policies of Hong Kong for the quarter century after the war and set the stage for a remarkable economic expansion. His resolve was tested constantly over his period in office, and it was only due to his determination, independence, and intellectual rigor that he was not diverted from the path in which he believed so strongly. This website examines the man behind the story, and the successful economic policies that he and others crafted with the people of Hong Kong. 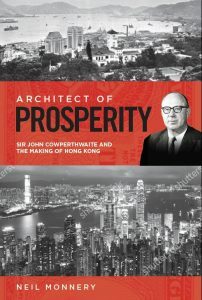 Architect of Prosperity: Sir John Cowperthwaite and the making of Hong Kong is a book about Sir John Cowperthwaite – the man Nobel Prize-winning economist Milton Friedman identified as being behind Hong Kong’s remarkable post-war economic transformation. Despite there being some articles about him and effusive obituaries there have, until now, been no published biographies of Cowperthwaite. This is a unique story of dogged free market economics coupled with post-war British public administration and the true grit and ingenuity of the Chinese people. Were these policies unique to a time and place, or are there lessons that we can draw from Cowperthwaite and Hong Kong’s success? The book won the Gold Medal for best biography (2017) from Axiom Awards. “Not before time we now have a fascinating book on one of those who helped create Hong Kong’s thriving economy. Cowperthwaite was a believer in free market economics well before this idea became popular again. Hong Kong should be grateful to him.” Lord Patten of Barnes, last governor of Hong Kong and author of East and West (1999) and First Confession: A Sort of Memoir (2017). “There are figures in history who deserve to be far better known and Sir John Cowperthwaite is one of those. Neil Monnery’s account of the way he shaped Hong Kong into a dynamic and successful economy now far more prosperous than its colonial ruler, Britain, is all the more fascinating in the light of the current debate about what drives economic development. Policy makers today can learn a lot from the focus and the willingness to ignore the conventional wisdom of the time demonstrated by Cowperthwaite and his colleagues.” Diane Coyle, professor of economics at the University of Manchester and author of The Economics of Enough (2011) and GDP: A Brief but Affectionate History (2014). “John Cowperthwaite is the neglected hero of the twentieth century: the man who, quietly and unflashily, but with great determination, created the greatest economic miracle on the planet. Now, thanks to Neil Monnery, he is neglected no more.” Daniel Hannan M.E.P. “Monnery’s biography of my favourite civil servant – Sir John Cowperthwaite – is superb” Steve Baker M.P.